KUA’s Good Neighbor Utility Assistance Fund is a voluntary customer contributory program that helps KUA customers experiencing financial difficulty pay their KUA utility bills in emergency situations. KUA is asking people to reach out and contribute to the fund. This program is designed so that customers who can afford to – and want to help others – can make voluntary contributions to the fund. It’s a small gift that could really make a difference in the lives of families experiencing temporary problems in this time of economic uncertainty. The donations collected through the fund are turned over to Osceola County Council on Aging, which is responsible for administering all funds donated through the program. KUA matches dollar for dollar, all contributions made by its customers. So that means for every dollar you contribute, $2 goes to help your neighbors, doubling the impact of your generosity. 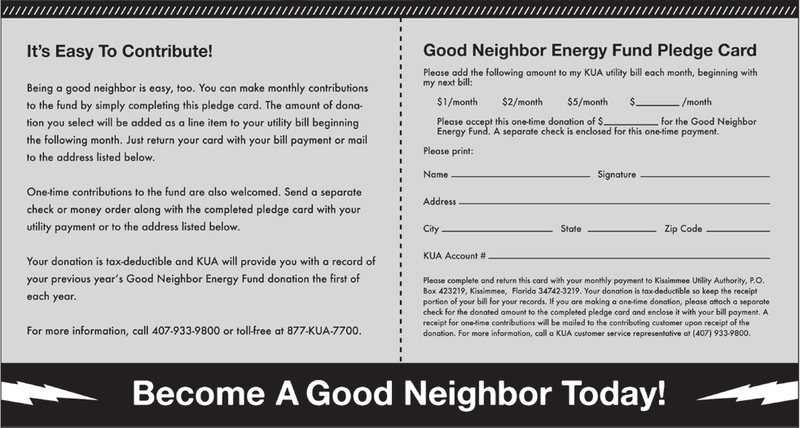 Download the pledge card below, sign it and return it with your bill payment, or you can send it directly to KUA at Good Neighbor Utility Assistance Fund, Kissimmee Utility Authority, 1701 W. Carroll Street in Kissimmee. The amount of donation you select on the pledge card will be added as a line item to your utility bill beginning the following month. One-time contributions to the fund are also welcomed. Send a separate check or money order along with the completed pledge card with your utility payment. Donations can also be made via credit cards. Simply click the “Donate” button below to complete the transaction. No PayPal account is needed to use this payment method. Sign up for Good Neighbor Round Up of monthly bills. For more information about the Good Neighbor Utility Assistance Fund, contact us at 407-933-9800 or toll-free at 877-KUA-7700.